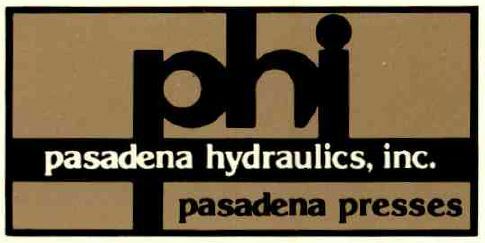 PHI was originally founded during the early 1940s as Preco Incorporated of Los Angeles, a maker of bench-type molding presses for laminating documents and identification cards. PHI expanded its capabilities and markets by producing larger presses and incorporating new technologies to serve a variety of specialized industries. Because of this vast experience, PHI is today a major supplier of presses for applications that require precise temperature, pressure, and position controls. Fast approach speeds, programmable temperature and pressure profiles, computer controls, and vacuum chambers are some of the options available with today’s PHI presses. Capacities range from 20 to 1000 tons, platen sizes from 8″ x 8″ to 60″ x 60″, and temperatures up to 1000º. In 1977, PHI became a division of Tulip Corporation, which at that time included the PHI equipment division and Molded Products division, a leading supplier of hard rubber and plastic battery component parts. The success of Tulip Corporation lead to the 1985 acquisition and integration of the Machine Tool Division of Conrac (Westminster, California), which previously acquired Leonard Precision Products (Santa Ana, California) in 1969. The unification became PHI-Tulip. In 1990, PHI-Tulip moved to from their facility in Los Angeles to PHI’s current facility in the City of Industry, California. In 2014, PHI and Tulip Corp. separated into two focused, market-leading companies. For more on Tulip Corp. today, visit http://tulipcorp.com/. In 2014, PHI became an employee-owned company. For information about PHI today, see About PHI.